Carne Asada con Tamarindo - Tamarind Barbecued Tri-Tip Steak with roasted root vegetable mash, crispy kale and tamarind salsa. This is one tasty steak! Earlier this week I was invited to check out Rosa Mexicano's unique Winter Eclectic Cuts menu at the Atlantic Station location in Atlanta. This special menu is available from now until March 11. The menu is termed "eclectic" because it features underutilized cuts of meat not often seen in mainstream dining establishments. For full menu, see below. We started wit a taste that's on the regular menu - scallop and pork belly tacos - these were really delicious and packed just the right amount of spice. We also had the famous guacamole, which is made table side - hard to come here without getting this! We tried both the starters on the Eclectic Cuts menu as well - the veal tongue tacos were tasty with a sweet fruit glaze and avocado rounding out the flavors. The crispy sweetbreads had a nice salsa verde served on the side. Scallop and Pork belly tacos. Awesome guacamole prepared table side. For our entrees we tried both the tri-tip steak (top photo) and the braised pork cheeks with organic grits (below). Both entrees were really outstanding. I love the tamarind sauce served with the steak and the steak itself was really outstanding - I'm not a steak person so this is really saying something! Braised pork cheeks and soft corn tamale grits - tender and delicious. In addition to trying the prepared by Rosa Mexicano's chef, you can also purchase the eclectic cuts raw to prepare at home - a neat feature to this very unique menu. For dessert we opted for the tres leches cake although the Meyer lemon frozen souffle on the special menu sounds delicious as well. Special of the day: Grilled Cobia with Curry sauce and vegetables over Himalayan rice. I was recently invited to check out Season's 52. Atlanta has two locations and we dined at the location in Buckhead. The second Atlanta location is near Perimeter mall and both locations have lunch as well as dinner menus. Seasons 52 prides itself on its use of seasonal ingredients, its well stocked wine room/wine bar and its upscale ambiance. The service was excellent and it was clear that we were not the only ones getting special treatment. Our server was extremely knowledgeable and timed all of our dishes to come out perfectly, allowing us to have a relaxed meal. An added bonus: everything on the menu here has less than 475 calories, allowing guests to indulge in a nice meal out without totally destroying their diet. My favorite dishes include the flatbread - about 6 varieties are offered and the special portobello mushroom kind we tried was fabulous - and the cobia with curry sauce, pictured above. Both of these items came from the sidebar menu that changes even more frequently than the regular menu, which is updated seasonally. I also adore the mini-desserts that they serve here. Special portobello mushroom flatbread with sour cream truffle sauce, spinach and garlic - very delicious! Organic tomato stack salad with blue cheese. Order this if you like onions - the onions are lightly grilled but not fully cooked. We enjoyed it but definitely not for the shy of onion. Pom Margarita and a specially made pomegranate blueberry spritzer - both were really tasty! Grilled lamb T-bone chops with asparagus, truffle mashed potatoes and red wine sauce. I always enjoy lamb. Roasted yellow beets with wasabi cream sauce. The sauce really has a nice kick that goes great with the creamy delicious beets. Seasons 52 serves the cutest "mini-indulgences" for dessert. I love how small they are so that you can sample lots! We tried (L to R) the chocolate peanut butter mousse, special chocolate raspberry Valentine, pecan pie and mango cheesecake. My personal favorites are the pecan pie and the cheesecake - a wonderful way to end the meal without feeling too guilty! Near the end of our meal manager Brian Farkas came by and took a photo of us. We saw him doing this for other tables, too. To our surprise, just before we left our server brought the photo to us in a special Seasons 52 frame. What a nice touch! This is a great place for a special meal or a nice business lunch - those who are watching their calorie intake will appreciate the thoughtfulness of the menu and those who are not won't notice! Honey Gold (left) and Mild wings at Miss Crumpy's. Back in December owner Freda Crump invited me to come try her wings. I was so busy I didn't have time to come by until a couple of weeks ago. As soon as we arrived Calvin (a native of Memphis) discovered that Miss Crumpy's is related to Memphis' Crumpy's chain - in fact Miss Crumpy is Crumpy's daughter! What a coincidence - turned out Freda even knew an old friend of Calvin's from back in Memphis - small world! We really enjoyed chatting with the namesake owner as well as her best friend and assistant Ron Jones. Both are warm, talkative and welcoming. Miss Crumpy's is located in the Westview neighborhood in southwest Atlanta. Although this is not a neighborhood I frequently find myself in, it is quite convenient to I-20 if you are traveling west out of Atlanta or returning from the Alabama state line. Inside a few tables are available for patron use but takeout seems to be the norm. Ron Jones and Freda Crump cook up some great wings! After chatting for a bit we decided to try a sampler of the fried appetizer snack goodness that is offered as well as 3 types of wings. The fried items are hand battered to order, resulting in a rich, thick and tasty crunch. I really appreciate that they hand batter rather than use frozen pre-battered vegetables. All of the snacks we tried were delicious, especially when dipped in ranch or honey mustard sauces! The wings did not disappoint either. First of all, it must be made clear that Miss Crumpy's serves the WHOLE WING - not the pieces of wing that you normally get. Thus, when it says 5 wings, it is the equivalent of 10 pieces. That's a lot of wing! Of all the options we really liked the Mild seasoned wing. The honey gold and the hot were also good but the seasonings and crispy yet moist mild really knocked our socks off. Fried green tomatoes, mushrooms and onion rings. The HOT wings! We didn't attempt the X-Hot or Suicide varieties - no thank you! Think about giving Miss Crumpy's a try and tell her that you found her on Amy on Food. The restaurant just opened in September 2011 so they are trying to generate lots of fans! You can check out their facebook page here. Miss Crumpy's does catering orders and recently had many Super Bowl orders as well. For some time I've meant to post on a category very much related to food: exercise and diet. In particular, I want to highlight kettlebell strength training and the Paleo diet. Kettlebells are a great overall exercise - I can personally attest to that! I discovered kettlebells here in Atlanta at Delaine Ross' Gym Condition where Delaine and several other instructors use kettlebell training to provide a great workout including cardio and strength training all in one 45 minute workout. With more than 30 classes per week at various times of morning and evening - plus some special lunch time classes too - there should be no excuse not to try out kettlebells. I actually used a kettlebell routine to prepare for my wedding last April. I attended 3-4 times per week and I noticed a recognizable difference within just a few weeks. Check out Gym Condition's website to learn more. And - don't worry if you are not in great shape or can't lift heavy weights. The bells vary in weight from just a few pounds all the way up to giant weights you can marvel at other people lifting! As you work out using the kettlebells you will be able to increase the amount of weight used. 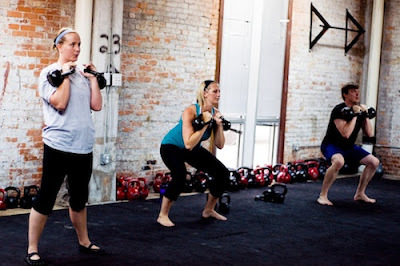 A typical kettlebell class in progress. If you can add the diet element in as well, you will see serious results fast! Recently I dined with Delaine to learn more about the Paleo diet, which is considered by some to be the most helpful in slimming down and staying that way. The diet includes vegetables, meats, eggs and small amounts of fruits and nuts. Paleo excludes dairy products (although some schools of Paleo thought allow dairy), sugars and grains and beans. Processed sugars and grains are particularly off-limits. Interestingly, bacon fat and coconut oil are preferred over vegetable or olive oils for cooking. This is because many vegetable based fats break down and interact with your body in a different way. So if you are following a Paleo diet it is better to use that bacon grease to cook your vegetables instead of the olive oil you thought was so good for you! Olive oil is allowed in salads, however. Click here for lots of recipes and Paleo resources and here for Paleo 101 and additional resources. Additional reported benefits of the Paleo diet include better respiratory health (less congestion) and healthier skin. There are several area restaurants offering Paleo-friendly fare as well. Delaine and I met at Caramba in its new location in the Pencil Factory lofts. Although it was difficult to skip the chips and salsa the above poblano verde was excellent with rich flavor and a tangy sauce. Delaine ordered the special chicken soup which was also delicious. In lieu of chips and salsa we had veggie dippers and salsa - nice to have a substitute so you can snack on something! Urban Pl8 also has Paleo items on its menu. Where else have you tried Paleo-friendly food in Atlanta? Sopa de Pollo "a la Mia". Veggie dippers with salsa and hot sauce. After much deliberation I tried the Soup-O-Rama which includes grilled cheese made with your choice of cheeses and optional tomato and a large soup. The soup selections change frequently but were very impressive. I tried the red pepper gruyere (I think that was the name!) but they had so many tasty sounding options including Brunswick stew and chili. They always have at least one vegan or vegetarian soup. I also sprang for one of the giant chocolate sea salt cookies that are next to the register. Everything was delicious, especially that soup. I definitely look forward to trying more from Common Market soon. The original location is on Commonwealth Avenue in Plaza-Midwood. I was recently invited to check out the newly opened Red Pepper Taqueria located in the old Artuzzi's location at the corner of Briarcliff and LaVista. Red Pepper opened just after New Year's and it is evident that a lot of thoughtful work was done to prepare the space prior to opening. The interior has changed significantly for the better - it's very festive with an open feeling, although it is quite loud when full (a common problem). A full bar has been added and get this - there are beer taps at the tables in the bar area. That's right, you can pour your own! We didn't try it but it looks like a lot of fun for groups or parties. We did try quite a few of the dishes on the menu including the above signature chicken mole dish. Mole sauce can come in many forms but it usually includes several types of chili peppers, ground nuts, dried fruits and sometimes even unsweetened chocolate. In some cases mole can have as many as 25 - 30 ingredients! The chicken mole here is a stellar version that I recommend for those who have never tried mole sauce - it is a bit spicy, just the way I like it! Chips and salsa - I like the green tomatillo best. The chips were warm and had good flavor. Made to order guacamole - you can get it mild, medium or hot - yum! My 2nd favorite dish after the mole - the tuna crudo in citrus marinade - this is so good I would have it all on its own for lunch! Can't wait to do that sometime. Prickly pear juice (left) and LaVista martini (right) - both tasty - the juice by itself was too sweet but I added soda water and then it was perfect - a nice cooling drink to go with the spicy foods we tried. Calvin liked the martini too! Tacos: carne asada, organic tofu and grilled trout - neat that they have so many fish and veggie options. You can have either corn or flour tortillas. Flan - my favorite dessert of the bunch: creamy, sweet and delicious. It's also gluten free. Churros with chocolate sauce - love the presentation here! I'd love to see the addition of a darker chocolate dipping sauce. The churros themselves were really tasty - sweet and fried to perfection. El Pastel AKA Drunken Cake. Red Pepper Taqueria is a welcome addition to the Druid Hills/Toco Hills area. Try it and let me know what you think! Judging from the crowd we saw on our visit this place is going to do very well!